If you’ve been staying up to date on what’s going on in the United States, then you’ve probably heard of several of the changes that are going on with immigration laws and policies. One of the major immigration programs implemented in the United States is to keep youth protected when they come to this country. As of September 5, 2017, the U.S. Citizenship and Immigration Services stopped accepting DACA requests. So, what exactly is DACA and how will it affect you? Let’s find out below. Our immigration information blog is dedicated to providing you with the most up to date information about what’s going on in the United States when it comes to immigration. As an immigration lawyer, we’re able to provide you with the assistance and knowledge you need to stay in this country. Despite the trying times we’re going through, it’s important that you continue to seek information about immigration as well as current events to keep yourself and your family protected. If you’re interested in scheduling an appointment with an immigration lawyer who strives to do the best job possible for his clients, then contact us today. DACA, or the Deferred Action For Childhood Arrivals, is a program that was conceived to be a relief from deportations from the administrative perspective. This program was implemented to protect immigrant youth from deportation. These youth were eligible to come to the United States when they were children. DACA provides young undocumented immigrants protection from deportation as well as a work permit. DACA expires after two years and has to be renewed. However, due to the recent administration in the White House, renewals and applying for this program have been on hold, which we’ll get to more of later. To help you understand more about what’s currently going on with DACA and how the program became implemented, we are providing an array of information about it. Even though the administration currently in the White House is putting a halt on accepting any new applications, it’s still vital to know the background as well as how many thousands of people this is affecting. 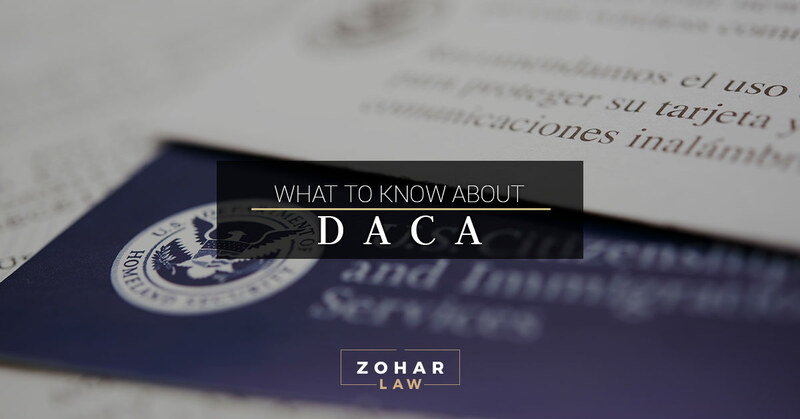 If you’re being affected by DACA, then take the time to contact an immigration lawyer at Zohar Law PLLC. DACA is a program that was created because many people who came to America brought their children who grew up here. It was acknowledged that the students who were raised in the United States were largely low priority individuals who had good behavior. The policy was implemented because the enforced attention of removing these immigrants was pretty low priority. Although, the student population of illegal immigrants has risen to about 65,000 graduates a year. When the DREAM act bill was created, it provided a strategy for permanent residency of unauthorized immigrants to meet the necessary qualification that Congress considered applicable in 2007. When it failed to overcome a bipartisan filibuster in the Senate, it was brought up again in 2011. The bill was passed in the House of Representatives, but it didn’t overcome the Republican filibuster in the Senate. As 2013 rolled around, the legislation was brought up again and reformed to include Dreamers the permission to stay in the United States and work and go to school. However, it passed in the Senate but wasn’t brought up to a vote in The House. The Dream act failed, but Former President Barack Obama decided to implement a policy that allowed specific immigrants to avoid deportation and obtain work permits for at least two years due to good behavior. Thus, DACA was implemented as a policy. This means it can be overturned at any time. The eligibility for DACA requires you to be under 31 years of age as of June 15, 2012. You must have arrived in the United States prior to 16 years of age. You must have lived in the United States from June 15, 2007, to present. You need to currently be studying, going to high school, or earning a certificate of completion or your GED. You cannot be convicted of a felony, and need to physically be present in American without documentation before June 15, 2012, or your lawful status expires as of that date. You are an honorably discharged veteran of the Armed Forces or the Coast Guard in America. Additionally, as of June 15, 2012, you had no lawful status. How Many People Are Affected By DACA? With the new administration’s decision to phase out DACA, nearly 800,000 undocumented youth are touched with this decision. Thousands and thousands of people will lose their jobs if this program is dismantled. DACA is under a lot of scrutiny and with almost 2,000 leaders around the country signing letters to ask the Dreamers for protection, the status of DACA is as of now on the fence. As Trump ran for President, he referred to DACA as, “illegal amnesty” and despite his expressed support for young undocumented immigrants. The administration has decided to move forward with dismantling the program because it’s “unconstitutional.” The program will be phased out for current recipients and no new applications are accepted as of now. If you’re in need of immigration information, then you can schedule an appointment for a consultation with Zohar Law PLLC.